The largest part of the new report is devoted to the detailed analysis of geometric inconsistencies, where we focus on rotation and scale (field-of-view) mismatches between the views in S3D movies. Implicitly these problems were already analyzed in our previous reports #1-5 through detection of vertical shifts between the views, but the new metric is designed to assess the possible origins of the problem directly. Furthermore, these type of mismatches tend to be more painful to the viewers compared to plain vertical parallax that was the main focus of the geometric analysis in the previous reports. However, the next parts of the report are far more interesting.. It appears to be the case that we are the first to perform a large-scale evaluation of temporal shift in stereoscopic movies (we welcome any tips regarding other research in this field). Temporal shift is considered to be one of the most irritating artifacts, while even small subframe shifts can be consciously noticed by the viewers, especially in fast-paced scenes with a lot of motion. Our experiments seem to indicate that it is the most easily noticeable artifact among all the relatively common ones. 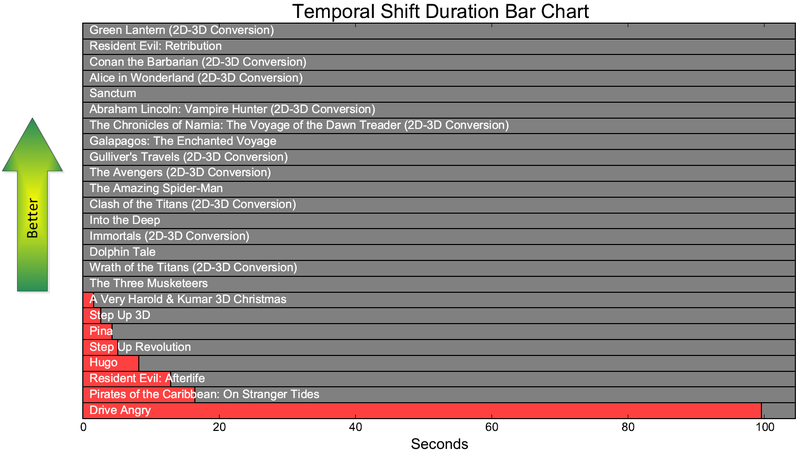 That's why it is rather surprising that 8 out of 15 natively captured S3D movies that we've evaluated contain at least one scene with temporal shift. We have detected 45 of such scenes in total, several of them even contain more than a half-frame shift, that could have been easily fixed (at least, partially) in post-production if those scenes were found at the right time. Moreover, there are software solutions that can fix subframe temporal discrepancies with a reasonable level of quality. And now, owing to advances in computer vision algorithms, it is possible to automatically detect this kind of problems and we hope that it will become a more widespread practice and help improve technical quality of S3D movies. Also it seems that we are the first to analyze a number of S3D movies for channel mismatch (scenes with swapped left and right views). It is certainly a very annoying problem, even more so than temporal shift. And its detection is further complicated by the fact that it is often hard to consciously notice channel mismatch, as our brains do a pretty good job of adapting and compensating for such anomalies. But nonetheless it definitely can contribute to the overall visual fatigue and headaches experienced by some viewers after watching S3D movies. Channel mismatch is obviously very easy to fix, so the main problem lies in its detection in the right time. 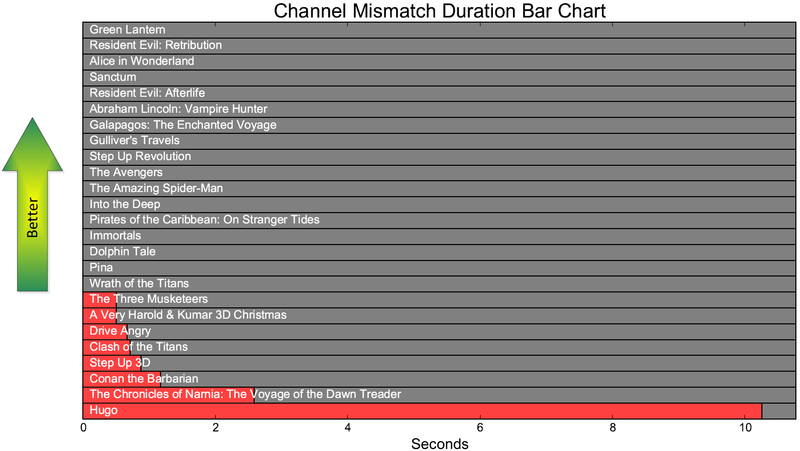 And our results show that it is not that rare: 8 movies out of 25 that we have tested contain at least one scene with channel mismatch. We hope that new instruments will enable more efficient quality control and help bring S3D technical quality to a new level. Currently we are looking for collaboration on upcoming reports #9,10. If you would like to participate by commenting on the draft versions of the reports, please feel free to contact us: 3dmovietest@graphics.cs.msu.ru. If, for some reason, you cannot make public comments for inclusion in the reports, we would really appreciate any other kind of feedback.